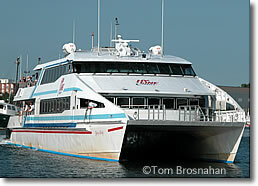 The fastest, most comfortable passenger-only ferries from Hyannis to Nantucket	are run by Hy-Line Cruises. The Hy-Line Cruises company runs fast, comfortable passengers-only ferries from its Ocean Street docks (map) in Hyannis on Cape Cod to Nantucket, and to Oak Bluffs on Martha's Vineyard island. In the busy months of July and August, it's wise to reserve your seats on the ferries, even if only a few hours before your planned departure. The alternative to the Hy-Line ferries is the Steamship Authority's passengers-only ferry, which departs from Hyannis's Pleasant Street docks (map), a 10-minute walk around the harbor from Hy-Line's Ocean Street docks. The Hy-Line fast catamaran ferry Grey Lady at the Ocean Street docks in Hyannis, about to depart for Nantucket.